Baby Luna and her parents. 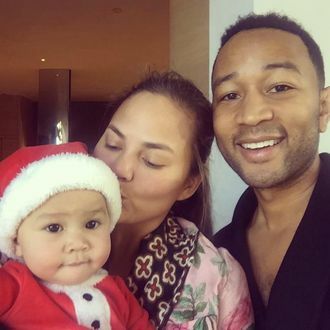 Happy holidays to you and yours, especially if “you” are Chrissy Teigen and John Legend and “yours” is baby Luna, who celebrated her first Christmas this year at the ripe young age of 8 months. As it was with Halloween, Ms. Luna was dressed for the occasion, this time in a Santa onesie, and she held her celebrity parents’ — and grandmother’s — rapt attention throughout the eventful day (Teigen’s mother, Vilailuck Teigen, was in attendance). That is, until Teigen discovered the joys of her daughter’s toys, specifically her Hatchimal (“We are all pretending this is for Luna,” reads Teigen’s caption on the accompanying photo). As you can see in the holiday play-by-play below, Hatchimals are awesome enough to make you miss some of life’s important moments. Happy holidays, one and all — but especially to baby Luna, because c’mon with that face.